Sun City Shadow Hills is Del Webb's second active adult community in the Coachella Valley. It is located in Indio, California two miles east of Sun City Palm Desert. This 55+ community is favored by buyers who want the latest desirable amenities and highly upgraded and affordable homes. This community is a perfect retreat for active adults who want to get the most out of life. Construction began in 2003 after the completion of Sun City Palm Desert and the community was completed in 2016. Many retirees are lured to Sun City Shadow Hills by newer homes that offer modern floor plans and upgraded finishes. This community offers a diverse lineup of homes, plentiful amenities and an active lifestyle that Sun City is known for. The Montecito clubhouse and Santa Rosa clubhouse are the central hub for all community activity. The 35,000 square-foot Montecito clubhouse boasts enviable amenities such as a state-of-the-art fitness center that includes the latest in high-end cardiovascular and weight training equipment, an aerobics and dance studio, arts and crafts studio, a bistro and indoor lap pool. There is also a grand ballroom, billiards hall, library, meeting rooms and a card room. Outside the Montecito clubhouse residents can enjoy the outdoor pool, five bocce ball courts, two shuffleboard courts and four lighted tennis courts. The Santa Rosa clubhouse is a welcoming 14,000 square-foot facility that boast many amenities to stay both socially and physically active. Here residents can get into shape at the state-of-the-art fitness center with an indoor walking track, enjoy a morning coffee at the Santa Rose Cafe, or attend a club in one of the meeting rooms. The Santa Rosa clubhouse also features a card room for attending game nights with neighbors. Outside of this beautiful facility there are two pickleball courts, one shuffleboard court, half of a basketball court and an outdoor pool with a patio. Among the world-class amenities is the Shadow Hills Golf Course, which provides 18-holes of magnificent golf designed by the championship team of Lee Schmidt and Brian Curley. Skilled players and weekend novices alike will find an exciting challenge at Sun City Shadow Hills. Plus, a new par-3 course is great for residents who want to get out and work on their short game. Residents can also take their furry friends to two dog parks within the community or attend a performance at the amphitheater. This 55+ community offers some of the most desirable low-maintenance homes for sale in the Coachella Valley. Buyers can select from over 30 single-family floor plans that range from 1,099 to just under 3,000 square feet. Del Webb offers four collections including the Shadow Series, Santa Barbara Series, Living Well Collection and Santa Rose Series. Most of these beautiful single-level ranch-style homes include two bedrooms, two baths and a two-car garage. Larger homes in the community feature up to three bedrooms, three-and-a-half bathrooms and three-car garages. Some homes also offer a den or office as well as a golf cart space. Some of these homes are finely appointed with included features such as granite countertops, dramatically tall ceilings, and rear patios. A steadily growing list of clubs and classes help community residents fill their days with exciting activities and events. Regardless of your passion, you are likely to find other like-minded residents who share your lifestyle interests. Those who like to stay physically active will appreciate the golf clubs, tennis, cardio classes, Zumba, Pilates and basketball. Those who love to play games will enjoy billiards, bocce, bridge, bunco, canasta and Mah Jongg. Residents can also get creative by participating in the opera appreciation, creative arts, writer's, or ukulele strummers club. This welcoming atmosphere allows residents to explore new interests and hobbies while making lifelong friends. This community has a full-time activities director who is continuously planning activities to encourage residents to get to know each other, including movies on the lawn, happy hours with live music, and chili cook-offs. Sun City Shadow Hills is located in Indio, California in the desirable Palm Springs area. For active adults who spend more time outdoors than in their home, Indio and the Coachella Valley is the perfect destination. The Valley is framed by the towering Santa Rosa, San Jacinto and San Gorgonio mountain ranges. The deep valleys and high ridges make for boundless recreational opportunities and breathtaking views. The warm weather and 350 days of sunshine a year have drawn retirees to the region for decades. Palm Springs is just 15 miles west and is renowned for its world-class shopping, fine dining, casinos and festivals. Residents have easy access to local beaches as well as several medical facilities throughout the area. Living in Sun City Shadow Hills means having countless opportunities for hiking, biking, camping and fishing in the surrounding mountains. This community's convenient location is only two hours away from many airports including the Palm Springs International Airport, Los Angeles International Airport (LAX), Long Beach Airport, John Wayne Airport and San Diego International Airport. With so much to do in and around Sun City Shadow Hills it is easy to see why active adults in Indio, California are flocking to this 55+ community. The Montecito is a 35,000 square-foot clubhouse that offers residents a wide variety of amenities. This beautiful facility allows residents to be involved within the community. The Santa Rosa is the second clubhouse within Sun City Shadow Hills. This 14,000 sqaure-foot facility features wonderful amenities to stay socially and physically active. Sun City Shadow Hills also has the Shadow Hills Golf Club, which has two 18-hole courses, a clubhouse, and on-site restaurant. Sun City Shadow Hills residents enjoy discounted rates. Sun City Shadow Hills also features several outdoor amenities to enjoy the beautiful California climate. There are plenty of activities available in Sun City Shadow Hills. Here is a sample of some of the clubs, activities and classes offered here. The Shadow Series are affordable, thoughtfully designed plans with maintenance-free living. These homes are located in Phase 2 of Sun City Shadow Hills. Homes in this series feature two to three bedrooms, two bathrooms and a two or two-and-a-half-car garage. The Santa Barbara Series homes are located in Phase 1 of Sun City Shadow Hills. Homes in this series feature two to three bedrooms, two or two-and-a-half bathrooms, and a two to three-car garage. Most of the models feature a den. The Santa Rosa Series was designed for space and comfort. These low-maintenance homes are located in Phase 2 of Sun City Shadow Hills. These charming homes feature two to three bedrooms, two to three-and-a-half bathrooms and a two to three-car garage. The Living Well Collection are affordable, thoughtfully designed plans with maintenance-free living. These homes are located in Phase 3 of Sun City Shadow Hills. The beautiful homes in this collection feature one to three bedrooms, two to three bathrooms and a two to three-car garage. We just purchased a home in Sun City Shadow Hills and are thrilled with the community. We are in our late 50's and wanted to find an active and welcoming retirement community that we can enjoy for the next 20-30 years. We feel like we have found the perfect place. The grounds are beautiful, my husband loves the golf courses, both fitness and pool areas are outstanding and we felt the value of the home prices was very attractive. We love to hike so are excited to join the hiking club. Our neighbors were so welcoming and friendly. We were invited for a wine and cheese party after only 3 days. We feel a real sense of community at SCSH. In addition having the Palm Springs and the beautiful Coachella Valley to explore for hiking, dining, shopping etc. made it a great choice for us. Fantastic relaxed resort lifestyle with great amenities and low HOA fees. We purchased a home in Sun City Shadow Hills (SCSH) in 2006 for future retirement as we were just in our 40's at the time. In the meantime, we have leased our home out and have not had any issues with the home or the tenants, our current tenant has been in the home for about 4 years and have extended the lease again. They love the community and their home. After all those years we have not had any issues with our home, plumbing has been fine, roof, appliances. We did have a few stucco cracks near 2 windows (probably settling) the cracks seemed significant to us so we contacted Pulte CS and they said they were not of the size that would be covered under their warranty (10 years) we called just after 10 years and Pulte repaired the cracks... We are very happy with the customer service & the quality of work. We are Realtors, so we know all the 55plus communities we introduced our in-laws to this lovely community which has been their home since 2004, they still love SCSH and thank us to this day for helping them decide to leave OC and move to the Desert! They have many friends are are enjoying an active retirement. SCSH is close to shopping, medical, entertainment. There is an onsite Restaurant w/ bar - Shadows Restaurant & Bistro at the Pro Shop! Two Golf Courses without membership dues! Tennis, Pickle ball, movie nights, Concert Series, Plays and so much more... there really is something for everybody to enjoy. We've sold many homes in SCSH since it's grand opening and thus far all our clients are happy with their decision and appreciate the lifestyle offered with low HOA dues as of 1/1/17 $255 per month. If you are thinking of retiring a few years down the line, consider buying now at today's dollars ... it's easy to rent out homes in the this community to quality tenants, there usually is a shortage of lease homes available, so consider this option we are happy we have our retirement home waiting when we are ready! This is a great community -- well managed, great amenities, the reserves well funded and low HOA dues. Couldn't ask for a much better place to live -- except for maybe an ocean close. My wife and I picked Sun City Shadow Hills because we love the active lifestyle. Pickleball is our favorite activity but we also participate in several other clubs too. We are never bored. The people are very friendly and we have made many new friends. We were extremely pleased with our stay this past winter in SCSH. We were looking for a community setting with a large variety of activities and the oportuniy to meet people and really get involved. SCSH provided us with exactly that. I really enjoyed the golf and pickle ball and Deb got involved with yoga and other exercise classes. I've lived in SCSH for two months now and I couldn't be happier!! I've already joined a club and I've been going to their events every week. My daughter and I explored the gym and we liked it so much we went back the next day. I live here year-round and I've enjoyed every day - looking out at the mountains from my lovely back yard!! I bought a new home in 2008 and I currently spend two months a year in SCSH in California. I love my home with its gorgeous view of the mountains. Vacation Pools, Inc. put in my dream pool and backyard this summer and it is absolutely stunning. The Clubhouse is always hopping, The indoor lap pool is wonderful! So is the gym! SCSH amenities remind me of those in a five star hotel. And the ocean is only a two hour drive away! 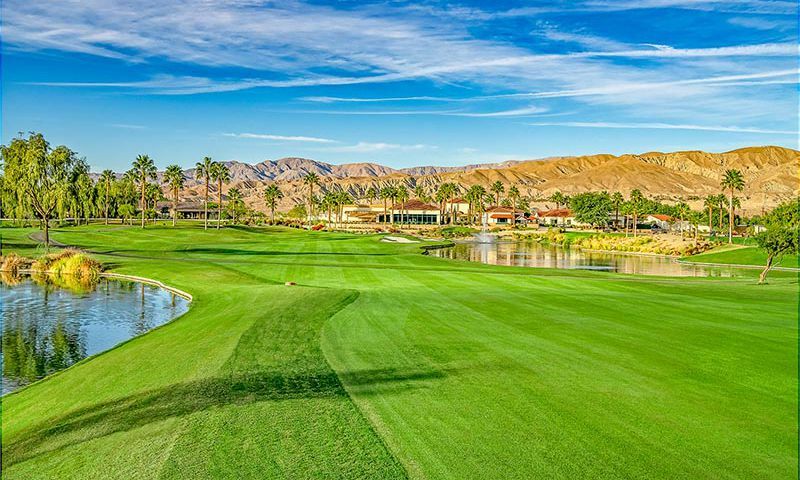 I have been coming to the Coachella Valley since I was a teenager and I always wanted to retire here so this is truly a dream come true: to live in this world famous golf and retirement resort and to spend my days outdoors and in my pool. This is one gorgeous paradise! We have lived here as seasonal residents for the last 3 years. This is an amazing place . . . we are active golf and tennis players and this is the perfect place for our life style. It does get hot in the summer and we have some occassional windy days, but overall we love it. We love it here! Never thought i would live in the desert! But after living here since 2005 we are convinced it is the best place to retire to for fun and peace. We are very active with playing cards bridge, mah jongg, singing, painting, performing in plays and musicals going out for lunchs and dinner with friends. What is so great is that most every one here is looking for new friends and we have found some great ones. I have lived in SCSH since it open in 2004. I winter here and have many new friends. The life style is the best. Each morning my neighbors and I go for our morning walk down Sun City Blvd. We have a small dog that enjoys going to the dog park that isn't to far from our home. My husband takes him each day and has many new friends also. The weather is the best you just can't beat it in the winter. There are many clubs to join and new friends to meet. I know anyone would be very happy at Sun City Shadow Hills. 55places.com is not affiliated with the developer(s) or homeowners association of Sun City Shadow Hills. The information you submit is distributed to a 55places.com Partner Agent, who is a licensed real estate agent. The information regarding Sun City Shadow Hills has not been verified or approved by the developer or homeowners association. Please verify all information prior to purchasing. 55places.com is not responsible for any errors regarding the information displayed on this website.